Dear readers, the TISSNET Registration 2019 has started soon. This examination will be conducted for providing the admission to the applicants in various MBA courses. Interested and eligible candidates are required to fill this application form and submit it in the giving mode. All detail of notification will be provided on this page before applying must check this properly. After that grab this opportunity and fill the application form. The Tata Institute of Social Science (TISS) will be conducting this TISSNET 2019 soon. 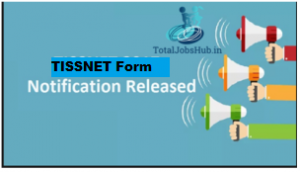 This examination will be selected on the basis of TISSNET Registration Form 2019. All required detail of notification will check through the lower sections of this page like education, application fee, documents etc. and then start preparation for the selection. Interested applicants must complete UG course with the minimum of 3 years and any other equivalent education is eligible for TISSNET Registration Form 2019. The exam pattern detail will be mention below on this page if you will search this then must check and start preparation for the examination. Time Duration: 120 minutes duration. Subjects Name: General Knowledge, Analytical Ability, Logical Reasoning and English Proficiency. Marking: No negative markings are applied. After qualifying the written test, the applicants will be shortlisted for the Group Discussion round and the Personal Interview round. PI (Personal Interview) on 75. As soon as candidates submit the online application form and examination fee, he/she receives an e-mail for verification. Dear candidate, please check the direct the link mention, in the end, can check the online registration for TISSNET 2019 and upload the required testimonials along with photo and signature. At first, check the official site of organization official site. Check official notification of this and read full detail carefully. Fill the application form with the help of require documents and attest copy of all documents, passport size photo and signature. Then check form once again properly and tap on submit button. At last take a print out of this for examination use. SC / ST (Annual income more than Rs. 2.5 lakhs) Photograph, Signature, TISS copy of challan (if paid by cash) & Caste / Tribe Certificate.